UL’s Laboratory in Neu-Isenburg/Zeppelinheim was established in 2001. This large-capacity laboratory covers an area of 4000 square meters over two floors, and holds CBTL, Dakks, ILAC and OSHA accreditations. A team of experts are on-location, dedicated to different sectors and able to provide testing services for various industries, including electrical safety, compatibility, performance, calibration services, automation and more. On-site product testing from household products, tools and appliances to consumer technology products and power supplies, according to international standards or to bespoke customer test procedures. We can supply equipment up to 100kW power. UL and International protection tests. 23 climactic chambers are available on-site for the long term aging of small and large equipment. Temperature ranges from 50 °C – 150°C, with the possibility to operate electrical devices up to 100kW power inside the climatic chamber. 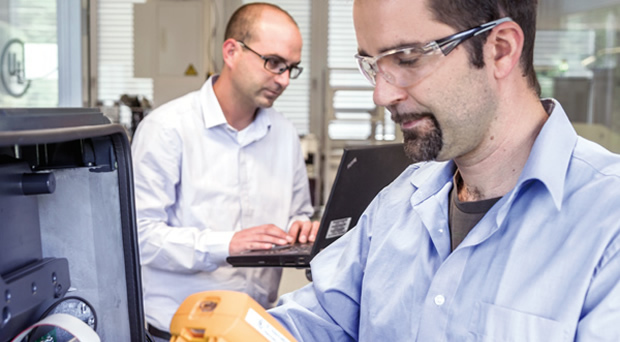 Our Neu-Isenburg Laboratory is one of our locations able to test high power photovoltaic inverters and other types of inverters in accordance with low Voltage directives. These tests can also be performed at the customer’s facility. The laboratory is also specialized and accredited for the tests required by several countries in Europe according to international, European and local standards and rules. For the purposes of connection to the public grids, the laboratory can issue test reports according to local requirements. Along with International and UL standard tests, we are able to offer industry requested tests like PID, EL analysis and more. As in our many laboratories globally, we can perform tests according to customer needs and requirements. One of our many locations where training for UL and international testing setups and standards can be offered. Software and hardware development services: A team of engineers, all highly experienced in Automation, are able to deliver customized software and hardware solutions depending on customer requirements, including data acquisition, analysis, control and generation of test reports. Our Highly knowledgeable Automation staff can also provide training for the development of software used for product certification, according to the rules of the international standards.